The third and final dreadnought in my Marine force is this chappy who I'm sure many of you will recognize from the Assault on Black reach boxed set. I like this model - I know it lacks in poseability when compared to regular dreadnoughts, but the out-of-the-box pose is quite dynamic and it's nicely to boot. 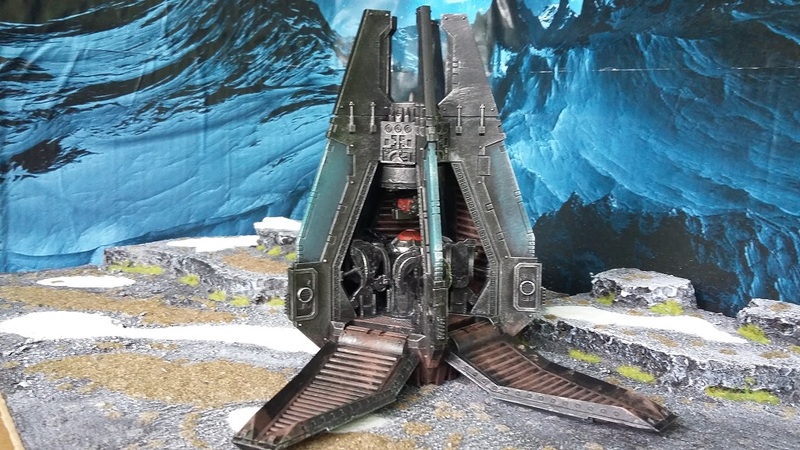 Nice model. 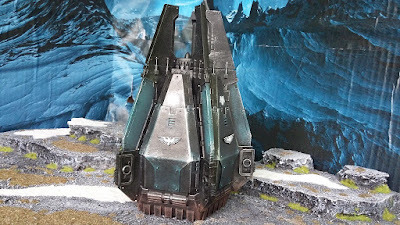 Another vintage model - one of the earlier Predator models from waaay back. 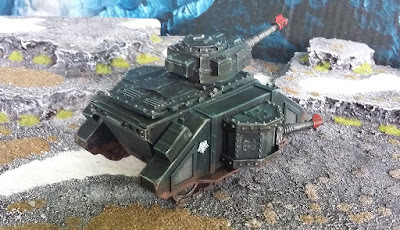 The "original" earlier Predator's had a turret that was rounded as opposed to this angular version so I think this is probably a second edition predator kit. 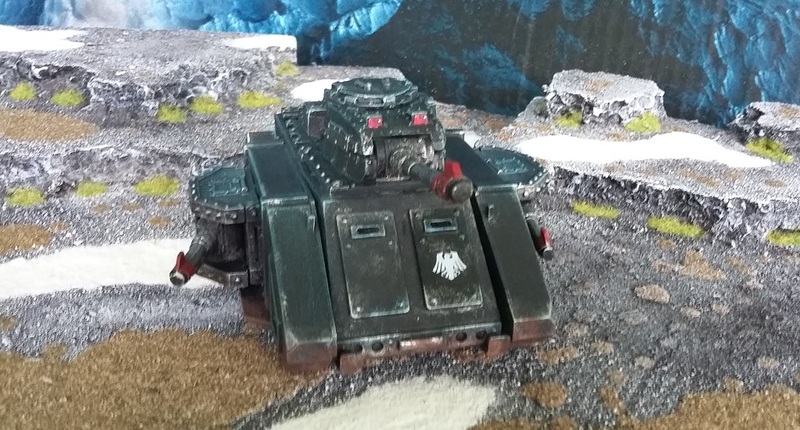 The predator kits were basically metal add-ons to a Rhino so the turret, sponsons and "roof" behind the turret are all metal on a plastic tank. It's a hefty model and wouldn't enjoy being dropped! 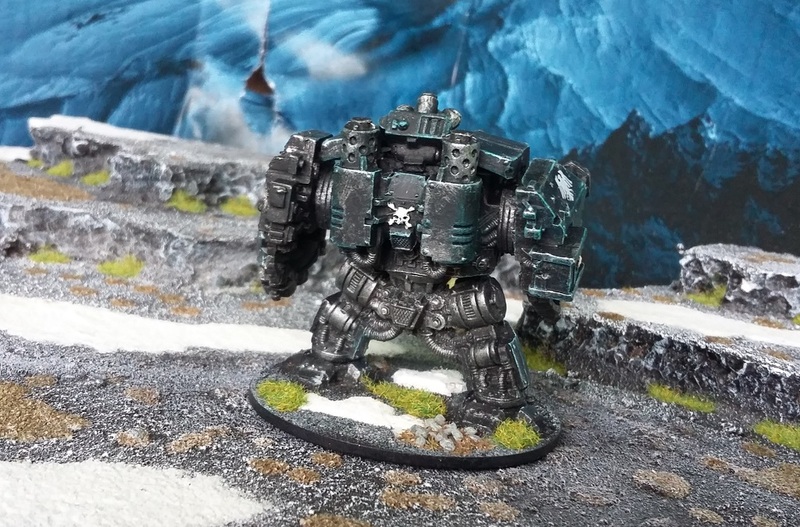 Everything in the Marine army can shift! Bikes. Landspeeders. Rhinos. Drop-Pods. Deep Strike, Assault Marines - everything about this army is geared towards getting troops where they can do their job fast! So I decided to gear my chapter towards being as mobile as possible. 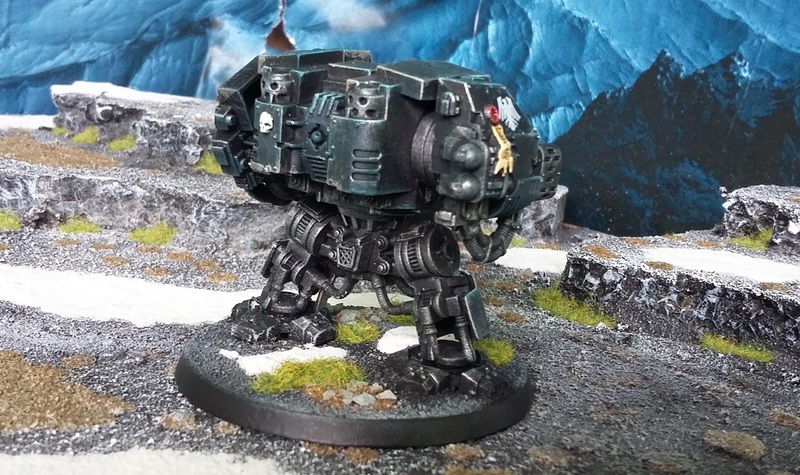 Drop Pods seemed a good way to do that - I have Rhinos to move troops so how do you move something bigger like a Dreadnought? 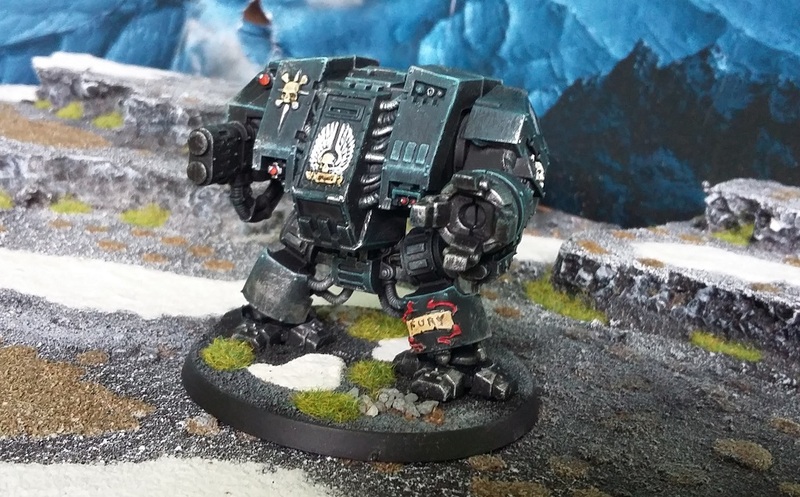 I like these models when they first came out. They're lacking in detail compared to the newer dreadnoughts and they have a few silly details on some of the chassis (like teeth, for example) but there was a certain something I always liked about them. In fact when the newer "brick on legs" version came out I wasn't keen on it at all (it has grown on me since, though). I'm sure I've mentioned before that I'm a cheapskate. I've also mentioned that I love mucking about with models. 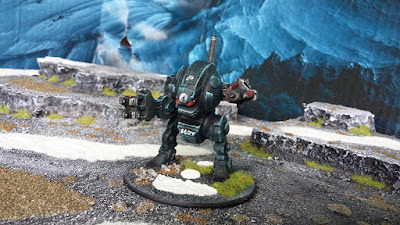 And that I have a liking for older models too. This tank ticks all three boxes for me - a home-made Vindicator tank built out of old bits of wire, plastic tubes and an original Rhino model. I started work on the siege shield for the front of the tank but haven't got around to finishing it yet. The rungs were simply made from some bent wire - I dismantled the model, drilled holes and passed the wire through the holes and hot-glued it to the inside. The main weapon is simply two plastic plumbing tubes cut down to length and one slid into the other. Those of you with longer memories will remember the problem with the original exhausts on these older models - the bent-over sections at the top are prone to snapping off. I drilled into the main exhaust barrel and replaced the missing parts with some bent wire coathanger (a great modelling aid - keep some handy). 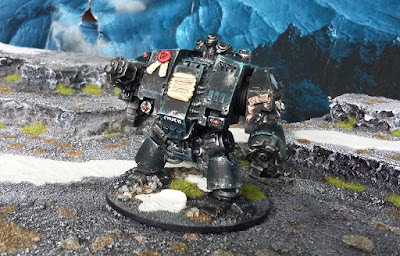 I have a small number of dreadnoughts in my Marine army - some more interesting than others. 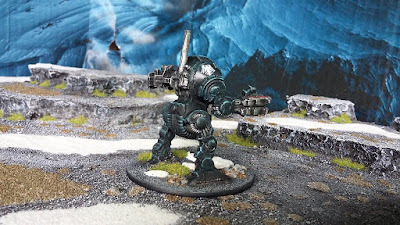 This is actually a very old model - when Citadel first redesigned the dreadnouhgt design away from the Rogue Trader classic this was what they came up with. This sucker is metal and weighs in at over 1lb. I've added a few details in green stuff (like the scrolls) to perk it up a bit.